Denny Hamlin knocked Martin Truex Jr. off the pole for Sunday’sFedEx 400 benefiting Autism Speaks NASCAR Sprint Cup Series race at Dover International Speedway. Hamlin toured the Monster Mile in 22.483 seconds (160.121 mph) in his No. 11 Joe Gibbs Racing Toyota to earn his first Coors Light Pole Award of the season and the 21st of his career. All three of Hamlin’s poles at Dover have come in his last six attempts, dating to the fall race of 2012. Hamlin edged Truex (159.723 mph) by .056 seconds. Kyle Larson (159.681 mph) qualified third, followed by Matt Kenseth (159.674 mph) and Joey Logano (159.596 mph). Series leader Kevin Harvick (159.497 mph) will start sixth on Sunday. Hamlin credited a tire test on May 11-12 with giving him an edge at the high-banked concrete track, where he has continued to improve throughout his career. 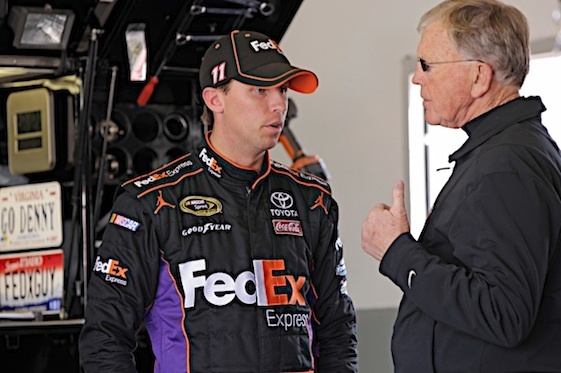 “We still haven’t won here, but we’ve been a lot more competitive, for sure,” Hamlin told the NASCAR Wire Service. “Whatever it is about the qualifying here, it seems to suit myself and my driving style. We’ve qualified well here in the past but haven’t always raced that well, but I’m pretty confident that, come Sunday, we’ll be contenders. Truex advanced through the first two knockout sessions despite trying to save something for the final. But his No. 78 Chevrolet developed a slight understeer during the third round. “We unloaded off the trailer and felt pretty good about the car,” said Truex, whose starting spot is a season-best. “We didn’t think it was a front-row car, but we worked on it between practice and qualifying, and the guys made some good adjustments. Notes: Seeking his 10th win at Dover, Jimmie Johnson failed to advance to the final round and will start 14th… Dale Earnhardt Jr. qualified 16th and Danica Patrick 33rd… Travis Kvapil and Jeff Green failed to make the 43-car field. (11) Denny Hamlin, Toyota, 160.121 mph. (78) Martin Truex Jr., Chevrolet, 159.723 mph. (42) Kyle Larson, Chevrolet, 159.681 mph. (20) Matt Kenseth, Toyota, 159.674 mph. (22) Joey Logano, Ford, 159.596 mph. (4) Kevin Harvick, Chevrolet, 159.497 mph. (16) Greg Biffle, Ford, 159.483 mph. (19) Carl Edwards, Toyota, 159.229 mph. (17) Ricky Stenhouse Jr., Ford, 159.046 mph. (18) Kyle Busch, Toyota, 158.975 mph. (1) Jamie McMurray, Chevrolet, 158.709 mph. (3) Austin Dillon, Chevrolet, 158.290 mph. (41) Kurt Busch, Chevrolet, 158.891 mph. (48) Jimmie Johnson, Chevrolet, 158.814 mph. (55) David Ragan, Toyota, 158.660 mph. (88) Dale Earnhardt Jr., Chevrolet, 158.479 mph. (31) Ryan Newman, Chevrolet, 158.263 mph. (27) Paul Menard, Chevrolet, 158.172 mph. (2) Brad Keselowski, Ford, 158.165 mph. (15) Clint Bowyer, Toyota, 158.144 mph. (13) Casey Mears, Chevrolet, 158.096 mph. (24) Jeff Gordon, Chevrolet, 158.082 mph. (43) Aric Almirola, Ford, 158.082 mph. (51) Justin Allgaier, Chevrolet, 157.687 mph. (5) Kasey Kahne, Chevrolet, 158.270 mph. (14) Tony Stewart, Chevrolet, 158.082 mph. (33) Brian Scott(i), Chevrolet, 158.040 mph. (9) Sam Hornish Jr., Ford, 157.673 mph. (47) AJ Allmendinger, Chevrolet, 157.660 mph. (7) Alex Bowman, Chevrolet, 157.301 mph. (6) Trevor Bayne, Ford, 157.123 mph. (38) David Gilliland, Ford, 157.054 mph. (10) Danica Patrick, Chevrolet, 156.658 mph. (46) Michael Annett, Chevrolet, 156.638 mph. (26) Jeb Burton #, Toyota, 156.624 mph. (83) Matt DiBenedetto #, Toyota, 155.750 mph. (39) Travis Kvapil(i), Chevrolet, 155.246 mph. (30) Jeff Green(i), Chevrolet, 152.964 mph.